Congratulations to all our customers! You're about to get a free upgrade to the newest version of iDentalSoft with enhancements to make your software even better (and easier to use). Updates have been made in the treatment area to make the screens and graphics more functional and aesthetically pleasing. You'll see more realistic tooth graphics and both the maxillary and mandibular arches in a single view. You can now enjoy this full display of the tooth chart in both the treatment area and in tooth notes. Click the button below to see an overview of the improved treatment view. You now have an ability to categorize your Auto-Codes and Multi-Codes to make them easier to navigate for your staff. Categorize by specialty, by provider, or any other attribute you choose. We enhanced our imaging features with new capabilities like continuous TWAIN capture, auto-rotation, and the ability to tag and categorize your images. We'll have more updates and improvements coming soon, so stay tuned. And thanks for choosing iDentalSoft! New features available in our Q1 Release! You asked and we listened! After hundreds of conversations with our valued customers, we've been hard at work converting client feedback into product enhancements and new features. Payment Plans. Improve treatment acceptance rates and boost production by offering patients flexible, recurring monthly payment plans for their treatments. Patient Online Self-Pay. Decrease your accounts receivable by allowing your patients to pay their invoices online, anytime. Lab Tracking. Track lab cases from sent to received to invoiced and sync lab statuses directly with patient records and scheduling activity. Statements by Mail. Automatically send statements by postal mail to your less tech-savvy patients. This is an enhanced integration with our partner, DentalxChange. Orthodontic Imaging. You can now capture photos and save them in a standard orthodontic mount, including composites of extraoral, intraoral and occlusal photos. Added Configurability. There are now more options to tailor iDentalSoft to your preferences. You can create different calendar views of selected chairs, change colors on appointment statuses, and place custom photos, logos or graphics on your patient portal. Enhanced Treatment Plan Display. Next month, we'll release massive improvements to the treatment plan area. 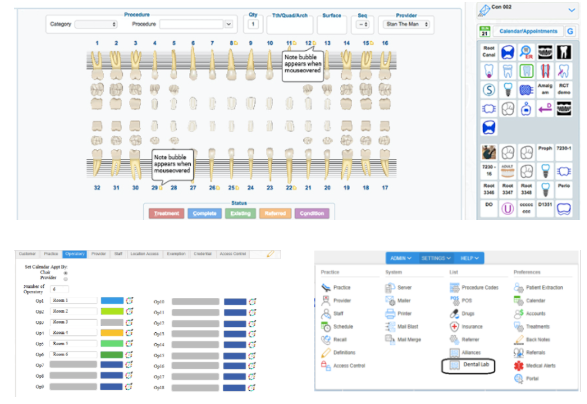 iDentalSoft will display the upper and lower jaw in a single view and include folders to better categorize your images and auto-codes by specialty. Schedule by Provider or by Room. Many of our customers share operatories among several providers. iDentalSoft supports scheduling appointments by provider or by chair/ room/ operatory. Bilingual Patient Portal. Spanish language is now supported for patients entering their health history with an easy toggle between English and Spanish. Mobile Carrier Lookup for Text Communications. This addition automatically detects the carrier associated with mobile phone numbers entered in the patient's record, so you won't have to ask your patients for their cellular phone provider.